Elimination Bek & Amy vs David & Betty - Who was eliminated? Home » Elimination Bek & Ash vs David & Betty – Who was eliminated? Elimination Bek & Ash vs David & Betty – Who was eliminated? It is the first MKR elimination tonight and it is Bek and Ash vs David and Betty. Who was eliminated from My Kitchen Rules tonight? The two teams will face off and be judged by Karen Martini, Guy Grossie, Liz Egan and Colin Fassnidge along with Pete and Manu. The lowest scoring team will be eliminated. Ash is making the crepes for the entree. Bek is preparing the ingredients for the green sauce. Betty is slicing up the beef for the entree. Pete and Manu can smell something burning in the kitchen, David has burnt the rice. Betty tells him to start again as she wants the rice brown. David is burning things again, he has burnt the pork crackling. He finally gets the second batch of rice nice and brown and he whizzes it up in a blender. Betty is tossing the beef with a salad mix. Ash starts plating up her crepes and there is 5 minutes to go before the timer runs out. Both teams get their dishes plated up on time. It’s time for the judges to taste the entrees. The first dish of the blind tasting belongs to David and Betty, the Lao raw beef salad. Karen says it was a delightful and textural salad. Liz says it was a vibrant way to start a three course meal. Pete enjoyed it but would have liked a little more dressing. 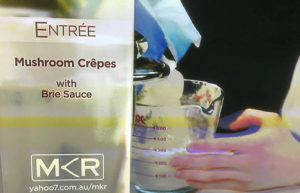 The next dish belongs to Ash and Bek, mushroom crepes with brie sauce. Liz says its a home-style dish. She doesn’t really like the brie sauce and says it has a lot of nutmeg. Colin says the pancake was thick, Karen comments that it was a pancake not a crepe. Colin says it is a beige dish. The contestants get back into the kitchen to begin their mains. David is making a tomato chilli and a green chilli sauce. Betty is making a herb marinade for the fish. Ash is preparing the onion and mushrooms for the rice pilaf. Betty is using basa fillets for the fish. There’s 30 minutes left on the clock. Betty wraps the fish in a banana leaf and then some foil and puts them into the steamers. They take the fish out, some pieces are cooked, some aren’t. The fish is falling apart on the plate. Ash and Bek slice up their venison and it is quite rare but they say they like it this way. Both teams rush to plate up their dishes and it can be seen on the plates. David and Betty have not put rice on some of their plates. The judges taste David and Betty’s dish first. Karen says her fish is still raw and the herb marinades are raw too. Liz says her fish is cooked well but the herbs are too strong. Colin says you can tell they’ve run out of time. Pete says he likes the green chilli sauce. Next they taste Ash and Bek’s venison dish. Guy says the venison is perfectly cooked although the sauce is a little sweet. Liz also says the venison is cooked perfectly and she likes the black rice. Manu agrees. Both teams get back into the kitchen to make their desserts. David is making a caramel sauce, with a secret ingredient, fish sauce. The judges taste Betty and Davids chilli salt fruits first. The judges enjoy the surprise flavour combinations of the sweet and salty and sour fruits. Next they taste Ash and Bek’s dessert. All the judges enjoy the dish but question whether it was too small and not quite a whole dessert. Who was eliminated from My Kitchen Rules? Here are the scores for tonight.